Adjoining the eastern boundary of Carlton, 2 km north-east of Melbourne's centre, Fitzroy was Melbourne's first suburb. The eastern boundary of Fitzroy adjoins Collingwood. The name comes from Sir Charles Fitz Roy, Governor of New South Wales, 1846-55. Alexandra Parade divides the former Fitzroy municipality into Fitzroy North and Fitzroy South. 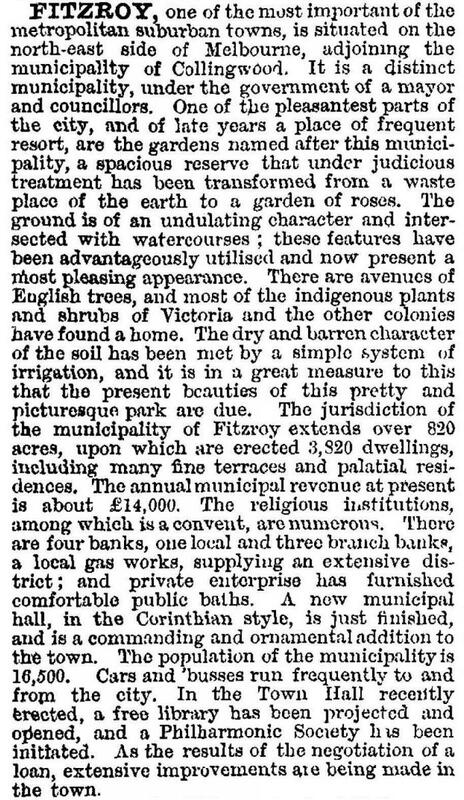 In 1839 the area of Fitzroy south of Alexandra Parade was subdivided into lots of about 12 ha and offered for sale. The area was called Newtown (which tended to extend eastwards into present-day Collingwood), and Newtown subsequently was called Collingwood. Present-day Collingwood was East Collingwood. In 1850 the area now known as Fitzroy was made the Fitzroy Ward of the Melbourne City Council. Three years after East Collingwood became a municipality, a separate Fitzroy municipality was created on 10 September 1858, by severance of the ward from Melbourne. By then its population was about 10,000 persons. Fitzroy's topography is elevated, with the land falling away east of Smith Street to Collingwood. The layout of streets was mostly in the hands of private subdividers: the government surveyor had prescribed only main arteries such as Nicholson, Brunswick, Smith, Gertrude and Johnston Streets. Building types were a mixture of masonry, timber and prefabricated, a few mansions and predominantly terraces after the gold rushes. Several terraces in Gore Street, Victoria Parade and Gertrude Street are heritage registered buildings. Early religion and education had a strong Wesleyan component. There were three Wesleyan/Methodist schools (1841, 1858, 1862) and a church at the corner of Brunswick and Moor Streets (1842). The earliest surviving church is St Mark's Anglican, Gore Street (1855), with the Christian Israelite church in Fitzroy Street being only six years younger. Fitzroy's earliest surviving building is the delicensed Devonshire Arms hotel in Fitzroy Street (1850). Brunswick Street became the main commercial sector, and Smith Street less so but lying on the route to Heidelberg. The route skirted Fitzroy North, which was laid out in the mid-1850s as a more gracious suburb. Fitzroy (south) was well positioned for workers' housing, as they could walk to work locally or in Collingwood, Carlton, North Melbourne or Melbourne. Local work sites included flour mills, footwear factories, a brewery, joinery works and timber yards. There were cricket and bowling clubs, but in 1865 football was some time off. During the 1880s Fitzroy (south) became increasingly working class. Mansions became boarding houses, and the single men in them attracted prostitution as a local industry. Other local industries included sly-grogging, cocaine dealing and internecine activities between pushes of under-employed larrikins. Coinciding with the descent into unlawful activity the Churches increased their charitable activities, focusing on ragged children, facilities for single women and the relief of distress. 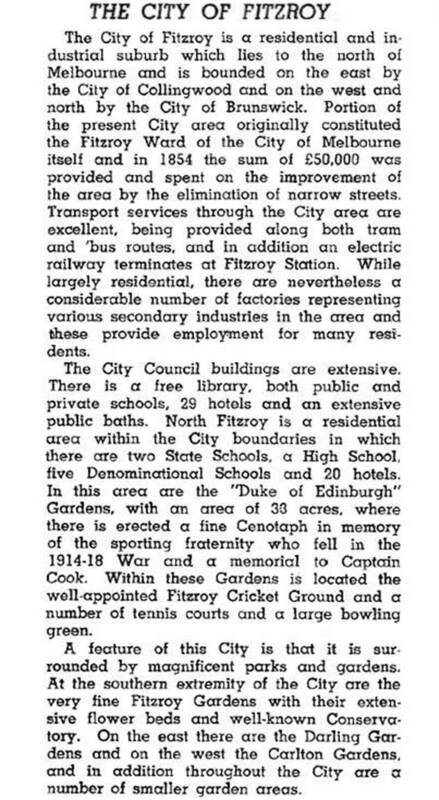 Much of the philanthropic initiatives, though, came from organisations outside Fitzroy. In 1883 the Fitzroy Football Club was formed from the remnants of the local Normanby club. It joined the Victorian Football Association and was one of the breakaway clubs which formed the Victorian Football League in 1896. Like the Collingwood club, Fitzroy's best years were its early ones, winning five premierships before 1914. In 1886-87 three tramlines were opened through Fitzroy – Nicholson Street, Brunswick Street and Smith Street. The Smith Street route extended beyond Fitzroy's borders by 1890 and had retail catchments in Collingwood and Northcote. It became a regional shopping strip. Foy and Gibsons, beginning as a drapery business in the 1870s, later became a landmark department store. In 1884 the Fitzroy side of Smith Street had several large furniture emporia. Names lasting until the next century included Clauscens furniture, Treadways drapery and Moran and Cato's grocery chain. Gertrude, Brunswick and Smith Street were nearly all retail, commercial or licensed premises. Railways, on the other hand, were in Fitzroy North, with a spur line running southwards to near the Brunswick Street oval but not reaching beyond Alexandra Parade. The Fitzroy council opened a pioneering free public library in 1877. The following year Fitzroy was proclaimed a city and in 1888 it substantially added to the town hall building to provide for the library and a court house. At about that time Fitzroy's pre-eminent entrepreneur MacPherson Robertson returned from America to introduce new kinds of confectionery to the boiled-lolly business he had begun in 1880 in the bathroom of his family's Fitzroy home. The ‘Great White City’ factory for MacRobertson's confectionery in Smith Street occupied half a hectare by the 1920s. Robertson became a renowned philanthropist, particularly during the Melbourne centenary celebrations in 1934. In Victoria Parade in 1893 the Irish Sisters of Charity began St Vincent's Hospital, which within 20 years became the second busiest in metropolitan Melbourne. 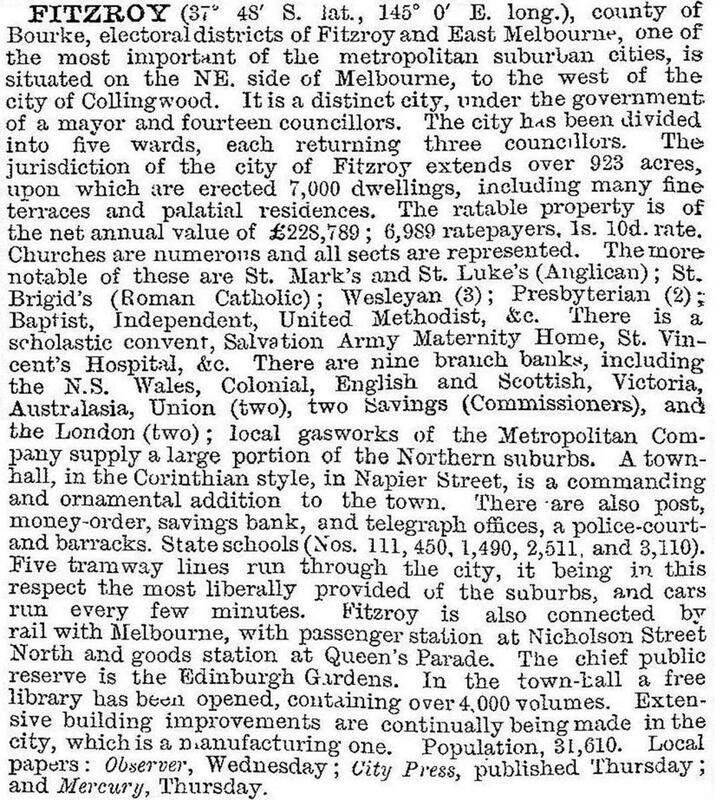 One hundred years later it remained in inner Melbourne while several others had been closed or moved to outer suburbs, although the prospect of removal was canvassed in 1997. The Free Kindergarten Union (1908), began with a kindergarten in Fitzroy, and the Salvation Army and the Presbyterian church established refuges for women. The impoverishment of the inner suburbs drew philanthropy, and the Depression of the 1930s kept it there. The Methodist church's Frederick Cato, a Fitzroy boy who established his grocery chain's main warehouse in Brunswick Street, supported the Methodist Mission. The Aboriginal community had support from Pastor Doug Nicholls, who played for Fitzroy Football Club, 1932-37. The Brotherhood of St Laurence, founded by Gerard Tucker in Newcastle in 1930, began in Fitzroy in 1933 when Tucker took over the Anglican Mission Church of St Mary. He organised for the relief of distress and declared war on slums. Tucker's activity coincided with F. Oswald Barnett's Slum Study Group, which led to the establishment of the Housing Commission in 1938. Fitzroy's slum reputation was accompanied by the decline in the shopping areas as central Melbourne (Bourke Street) grew stronger and modern strips were built in newer suburbs. When the Housing Commission built modern estates in outer suburbs in the post war years some of Fitzroy's population took advantage of the new houses. Their places were often taken by post war immigrants. By 1954 about 12% of Fitzroy's population was Italian-born; in 1966 33% were Italian or Greek-born, and Australian-born had fallen from two thirds to one half. The Italian-born and the population with an Irish background constituted a strong Catholic body. Within ten years, however, the numbers of Italian-born and Greek-born residents had halved and within another ten years they had halved again. The first Commission estate was the mid-1950s St Laurence Estate, off Hanover Street. The second was the high rise block at Brunswick and Gertrude Streets, obliterating several streets of small cottages, mostly built before the more substantial terraces further east, but which would have been acceptable to gentry renovators in ten years time. The high rise estate's corner touches a Conservation Area which is on the National Estate Register. Moving up Brunswick Street from the estate there is the number one store of the Cox Brothers retail empire which failed after the 1960s credit squeeze. Moran and Cato's massive warehouses remain, but much else of Brunswick Street has been remodelled and redecorated to become an eateries and entertainment strip, picking up from Lygon Street, Carlton, where rents had forced out the zany and the esoteric. Between 1947 and 1991 Fitzroy's population fell by 44% to 17,885. The non-Australian born component, however, moved from 42% in 1947, to a high of 49% in 1966 and back to 40% in 1976 and 1986. The ethnic composition moved from noticeably Italian/Greek to a wider range, with nearly 9% from Asia. Fitzroy (south) has Catholic primary and secondary schools and a State primary school. The Australian Catholic University is at the southern end of Brunswick Street, along with other Catholic institutions and buildings. In 1987 the median house price was 125% of the Melbourne median, and in 1996 it had moved to 175%. In 1997, however, it was reported that 49% of children in Fitzroy were in families on a welfare benefit or classified as working poor. This statistic reflects the long-term existence of people in Fitzroy who are on low incomes and who have experienced social inequality. In the 1970s secular welfare organisations were created – the Fitzroy Legal Service (Australia's first independent free community legal service), the Aboriginal Legal Service, the Aboriginal Health Service and the Aboriginal Child Care Agency. Fitzroy has class and ethnic diversity. It also has the Brunswick Street retail and entertainment strip and housing stock ranging from solid bluestone foundations to high rise estates on concrete columns. Several terraces, occasional surviving mansions, church buildings, a former cordial factory and a former cable tram engine house are heritage listed. A new micro dairy, Saint David Dairy, began production in Fitzroy in 2014. Residents of Fitzroy joined the campaign against the East West Link road tunnel over the compulsory acquisition of property and disruption from construction. On 22 June 1994, Fitzroy city was united with Collingwood and Richmond cities to form Yarra city. On 18 November 1993, part of Carlton North had been transferred from Melbourne city to Fitzroy.